I just read The Story Girl recently! Like, oh (!) . . . three years ago. (Time is flying.) At any rate, at the time I last read it I wrote up a long(ish) review sharing my thoughts and I didn't really feel like repeating was necessary so "soon." Instead I'll do something a little different. The truth is, I haven't gotten around to reading as much Lucy Maud this month as I might prefer . (I'm half tempted to stay up all night and re-read Anne of Green Gables before the week is out but we'll see!) I read some more of her journals earlier this month but wasn't sure exactly what fiction I wanted to tackle. This month I began the debate with myself over whether it was a good idea to introduce my kids to Montgomery or to stay patient and keep waiting. My oldest is eight and I wanted to wait and introduce him to the books when he was good and primed to enjoy them. Well. Amy mentioned that she was planning to read The Story Girl aloud to her kids this month and after thinking on it, I thought that was a great idea! My kids have watched a few episodes of Road to Avonlea (season 1) with me and so they were sort of familiar with the characters to begin with. I decided to start there. We'll start with Bookworm3, age almost 4. 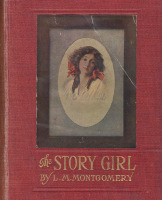 What was your favorite part in The Story Girl ? When Felix was eating all of the sour apples [trying not to make a funny face]. Who was your favorite person(s) in the book? Cecily and Felicity. Why were those your favorite? Because they were nice. Would you like to hear more stories about these kids? Yeah, 'cause I liked them. Did you think the book was funny or sad? Funny. If someone asked you whether or not they should read The Story Girl, what would you say? Yes. Mom note: I was surprised that she was able to list a favorite part of the book at all! I didn't think she was really paying much attention but she was very specific about which part she most enjoyed. Hurrah! Next up is Bookworm2, age almost 6. What was your favorite part in The Story Girl? When Peter got sick. Why? Because all the kids who were not sick were crying a lot. Why? Because she told exciting stories. Would you like to hear more stories about these kids? Yes. If someone asked you whether or not they should read it, what would you say? Yes, it's very good. What was your favorite part in The Story Girl? When they held the sermon competition. Why? 'Cause it was interesting; it was fun to listen to. Who was your favorite person in the book? Cecily. Why? She was always praying. Did you think the book was funny or sad? I thought the book was long. If someone asked you whether or not they should read The Story Girl, what would you say? Yes, but it's a little scary. What made it scary? The story that the Story Girl told about the devil in the road. Would you rather I had not read that part of the story to you? I think it was ok that you did. Mom note: There is a chapter towards the end of the book wherein the Story Girl tells the others about a man who walks in the woods at night and is attacked "by the devil himself." The devil grabs the man by his shoulders and leaves a burn mark and, yes, the story gets a little tense. I read it anyway but I was wondering what the kids would think about it. I asked Bookworm1 if he'd been thinking about the story, if it bothered him, or if he had had any nightmares and he said he was good. I'll trust that's the case but thought it interesting that he mentioned it and so I'll pass that word of caution onto you. All of my kids were delighted to know that there is another story about the King cousins. We just might have to read this one next January. As a reminder to all of you, the 6th Annual Lucy Maud Montgomery Reading Challenge will come to a close at the end of this week. I will have a wrap-up post ready to go on Friday (although I myself will probably have some "spill over" posts into the following month). Hope you are enjoying yourselves! Neat idea for a post! This is one I haven't read yet. I'm trying to step on it with Emily Climbs but not actually enjoying it very much so far - hopefully it will turn a corner now that I am just at the part where she goes to school. I went to the library today, and discovered a few seasons of Road to Avonlea, so I grabbed the first one. :D I'm going to see if Grasshopper (at least) will watch it with me. I liked the children's reviews. Nice to see their perspectives. I've read and enjoyed several of the Anne of Green Gables books, but haven't read The Story Girl. Sounds interesting. I read it more than 10 years ago, but don't really remember it.